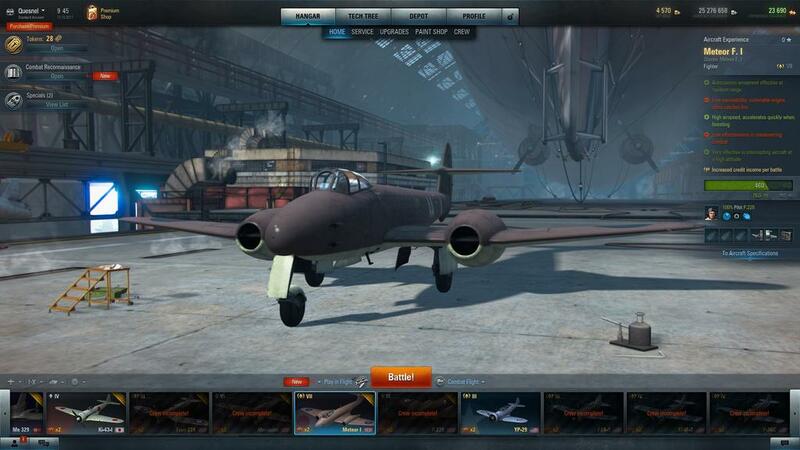 It has been nearly two full months since I last sat down and played any real measurable time in World of Warplanes. Up until that point, I had just completed the Operation Dynamo event and parked a premium Supermarine Spitfire Ia in my hangar. 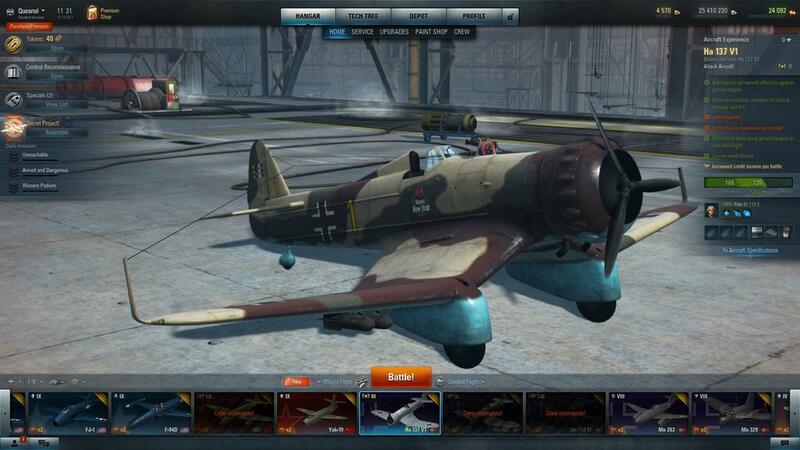 As a side quest, I also collected a LaGG-3-4, then proceeded to play a few Japanese offerings....then faded away. From then until now, I have been rather busy with real life (work, family and another, non-game project which I have a stronger passion for than Planes) so finding the time to come back here, let alone keep up with what was going on and what was yet to come, just wasn't near the top of my list. However, I have caught a few glimpses on the forums (a comment here, a picture there) from the 2.0 CT server and decided to wait for the big day, before making any kind of a return. At the time of writing all of this, I am only 40% of the way through the download of the update, still a ways to go. Will I like the changes? Hard to say, I have tried to actively avoid the topic of 2.0 and wanted to experience it first hand, free of influence from the comments of others, positive or negative. To be fair, I am not completely oblivious to the major changes this game is about to go through, discussion of this is reached some of the far corners of the internet (and a few real life friends who know me for who I am here), so I did find out some stuff, despite putting fingers in my ears, going "na na na." Nevertheless, the day has come, the update is underway and I will post my thoughts and a gameplay video or two on this very thread. Stick around. I won't download it myself. Thanks for being our guinea pig. If you like War Thunder you may like it but if you like War Thunder you are probably already playing it so why play a copy. I used to have a handle on life until it broke off. More like canary in the coal mine. Well, somebody has to, I suppose. You know those "taste this, it's terrible" moments? A few times I did and it wasn't too bad (at least, I lived to tell the tale). Because I have more invested in WoWP, and the WT controls are horrible. We get better controls but we have a horrid UI a UI that makes takes the enjoyment from the game. The client updated fine, figured I would make sure the video drivers were current as well. First thing that struck me was the new hangar. What's up with the Zeppelin? Where are the doors to get my aircraft out of here? Seems the aircraft in this environment have a more 3D look to them! After I got over those revelations, I poked around the UI causally, nothing appeared to leap out me is being totally different and warranting a closer look. Another inspection of things told me all of my aircraft were still here, something about one or two vanishing had me a bit worried (not sure were I heard that from). Now, before you give into the urge of watching the video below, a few things to consider. One, I am a little rusty in the production and editing department, two months of not making this type of content defiantly shows, plus I found out there are no replays for now, so my usual opening scene is missing (if you have seen my previous movies). Secondly, the game is being played in "as installed" state, meaning no custom configurations (like my paint schemes) or key remapping (my old settings didn't make the transfer to the new version, something I corrected in later battles). And finally, I played "cold," as I stated earlier, I logged zero hours on the CT server, so my grey matter and muscle memory was still programed for 1.9. Flying a fighter, I stuck to the doctrine of going air-to-air as much as possible. However, either the Meteor has lost a lot of it's former performance or the air is a lot stiffer than it was before (this has happened in an earlier update 1.4 or 1.5, can't remember which one for sure). Perhaps, the gravity pull has been cracked up a bit? For whatever reason, the plane felt heavy, slow to turn and a whole lot less maneuverable than memory serves. A very disappointing experience. I don't particularly like how cluttered my screen has become, debating on relocating/removing the radar scope, for example. I am not a fan of respawning, despite the fact I died more than once during this encounter. I have learned and accepted that you should get one life to live and by making the most of that, through wise target selection and environmental awareness, one life is all you should need. I believe respawning can and will promote a certain level of carelessness, which will dull the learning curve of the game, making for some less-than-enjoyable battles. Speed, maneuvers and dogfighting is what I want out of Planes and to a degree, that aspect is still there. During the Meteor battle, I was able to get the drop on enemy aircraft and fire off a lot of rounds, some even hit my intended target too! The loss of the lead indicator is a handicap I could learn, in time, live without. Without this handy tool, I could adapt to zooming in (which is an experience of it's very own) or just eyeball ahead of the target and roll the dice on making some hits. There are a few other things I didn't experiment with, such as high/low altitude penalties (take a fighter below the deck and see what it does/doesn't do), make notes to myself on boost/weapons cooldowns and a few other items. As I write this, I have a few more battles under my belt and I still have mixed feelings about things. I can't say for certain that I am fully onboard with the radical changes that came with 2.0, but I am not going to dismiss this title from my computer either. For the next while, I will play out a battle here and there, when I get the time and try to experience more than what I have thus far. Low alt penalty is completely removed - you can take a Banshee all the way down and fight like you are at optimal altitude. Good for you to make your own judgment though. I am deaf, silent, and fly with unrealistic controls. Do not count on me to carry - my back's already broken from overweight. I cannot believe that WG considered this game "ready for release". It looks/feels/plays like it's unfinished. I believe that WG had a timetable for 2.0 and that all the development time has run out----they've now decided to dump 2.0 on us as is, warts and all. The real reason that 1.9 and 2.0 did not remain separate (and available) ??? Because no one with access to 1.9 would play 2.0 as it is right now. Edited by Swearengen5, 12 October 2017 - 08:29 PM. That would explain a few things. Oh? Why would they do that (wait, don't answer that)? I doubt I will make a final call on 2.0 anytime soon, still on the fence about a few things. It looks/feels/plays like it's unfinished. Based on my experience so far, I agree. Edited by Quesnel, 12 October 2017 - 10:25 PM. Despite 2.0 being the "Bomber Update," I don't want to abandon my efforts with Fighters. I spent a great deal of time attempting to learn and practice the "Boom and Zoom" along with the "Turn and Burn" playstyles, in a serious effort to step away from my comfort zone of flying Ground Attack aircraft, usually in their traditional role. Granted, I never became a master in this class, but I did discover the challenges and rewards of fighting up high, as opposed to tending to the garden below. However, that was all pre-2.0. Now, with the sweeping changes to the game, from the graphical displays absent from combat, stiffer movements from the aircraft themselves and having to spend a fair amount of time adjusting my keyboard and mouse control scheme to mirror 1.9 settings, would all of my previous efforts have been for nothing? Now, if you watched that like a entertaining and somewhat amusing TV commercial, you saw a lot of action, a crowded sky and yours truly dying twice in a very epic fashion. However, if you viewed that with the critical eye of a professional movie critic, you picked up on a lot more, such as the regenerating health/hit point bar, the lack of serious performance penalties (altitude and maneuvering) and perhaps even more things I haven't listed here. Not to take away from the effort I put into this sortie, but I felt the game....somehow helped me, to achieve this victory. What are your thoughts? Well... I didn't played a "Live" 2.Oh game, just a few on the test server (but what I've seen on your videos is not quite different), not my game. I'll be following from time to time to see if anything changes for better, and maybe sometime I'll rejoin. By now, clear skies and tail winds! It was nice and sometimes fun. Not anymore. 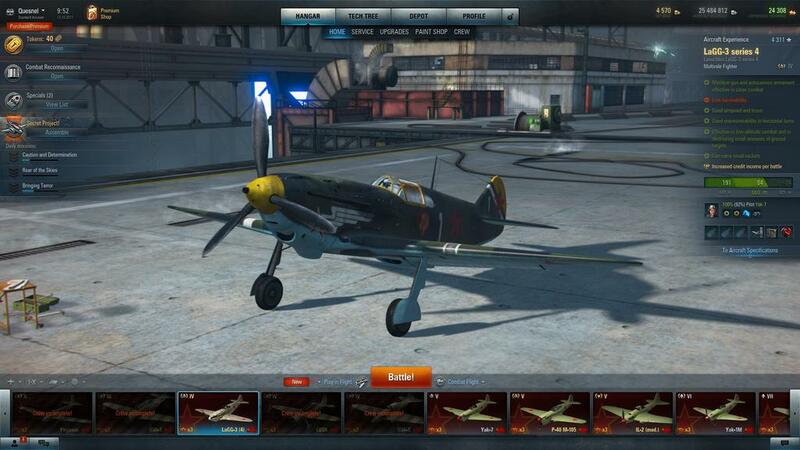 With the launch of World of Warplanes 2.0, there seems to be a giveaway celebration going on. Announced here, I quickly collected the Corsair Promotion (after completing a few tasks to earn points for the whole reward) and then checked my email for a Bomb and Respawn 2.0 message (got something called the Carrier Bundle, not exactly sure what was deposited in my hangar from that). I am sure I received some really great stuff, but there was one new acquisition that I couldn't wait to try out....THE FRENCH PLANE! While others may have purchased one or more before now and some might have even collected them from Missions, I never got around to laying my hands on a single aircraft, until now. Not that I am a conscientious collector....but not having one of these "blue birds" made the fleet feel incomplete. So, after playing out over a dozen battles in Update 2.0, here are some of my thoughts, for those of you interested in reading them. While Conquest isn't an original to Planes concept (quite a few people out there are quick to point out another game of this genre that has the very same thing), it does offer an alternative to the same old - same old Team Deathmatch mode that has been the mainstay to this game since it's inception. However, the grievous error came by forcing it as the only choice to play the game, turning off and away quite a few members from an already small playerbase. Although too late to suggest and implement now, but perhaps having both modes available as a selectable option (as seen in other WarGaming titles) and collecting statistics from those player choices might have smoothed out the current mixed emotional situation before it even started (if Deathmatch is just on a temporary hiatus and will return in the next few updates from now, making an announcement about that very soon might also help matters). The removal of Birthday Missions (although announced to return) was enough reason for some people to not login and play for a bit. With no goals to try and complete, why bother? As for the gameplay itself, I have gotten used to the ingame changes to how the aircraft fly and perform (more or less) and configured my controls to offer up results that nearly mirror my 1.9 settings as close as I can get them. I can't understand why they were reset or who thought that was even a good idea to do so, but I just quietly fixed the problem and moved on. For me, there is a lot of missing information from my screen as I try to do battle in 2.0, that was there in 1.9 and before. I certainly hope this is also returned in a near future update as a form of partial restoration or a selectable option from the Settings menu (I may consider installing a mod that does this, from a trusted source of course). Some people can honestly relate to just how critical it is to know particular things concerning the aircraft, it's current state and knowing who/what is going on in the environment around them, it's been know to be a game changer. 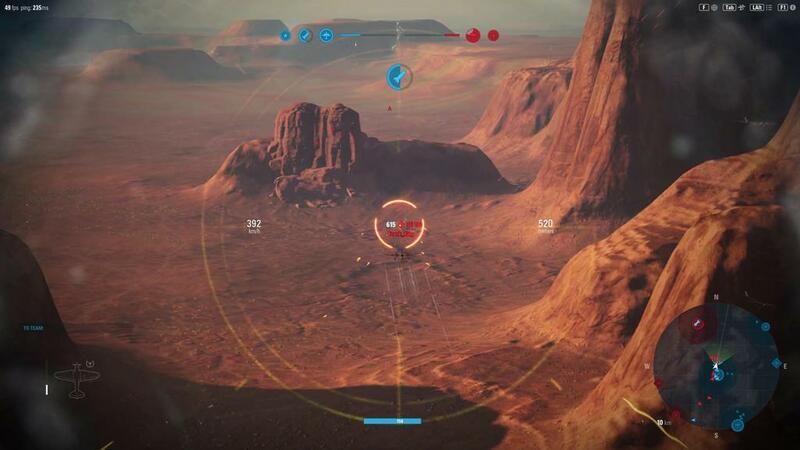 There are some superficial things I really like (such as the former El Halluf, now just known as North Africa, complete with pyramids) and some I don't (a few enemy planes I have shot up and caused them to explode right in front of me, at very close range, left me seeing spots for a few seconds). Some sounds and music are an immersive improvement, others are just downright annoying. I find myself with agreeing with many others that this does feel like an unfinished product and a lot of work needs to be done to it yet. Some players may return in future updates, if some of what I covered above (and more that I haven't) happens. Others have had enough, their patience finally running out with this final straw for them and have left, perhaps for good. In the meantime, I will still play here and there, waiting and seeing what will happen next. Although I can't quite put my finger on why, but I have always been drawn to the unique design of the Bell P-39 Airacobra. Perhaps, it was the unusual mid engine layout, or even it's odd football-with-wings shape, I have given up trying to rationalize the draw to it long ago. Despite that, I had never owned any prototype or production version in Planes, until now. 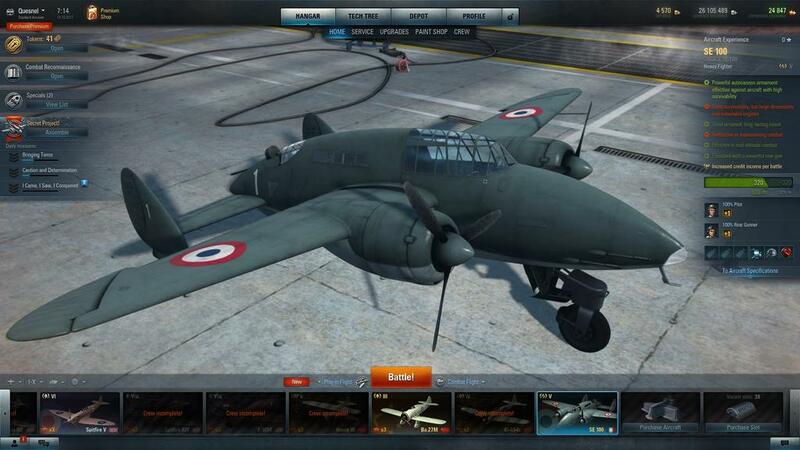 Part of the recent Corsair Promotion, along with the French SE 100 Heavy Fighter, I have now put the Naval prototype, tier V XFL Airabonita into my fleet. The armament configuration isn't new, two machine guns supporting a heavy, large caliber cannon, many other aircraft in the game have this kind of setup. It was the low to mid altitude maneuverability and weapons package together I was looking forward to, especially with the changes in 2.0. I have flown this before, including the higher tiered, Soviet marked P-39Q-15 in previous CT servers and produced mixed results based on the mechanics and adversaries of those pre-2.0 versions. Despite most of the damage I am producing comes from the machine guns, when I do score a hit on the proverbial mosquito with the big meteor cannon, it hurts them, badly. So far, the XFL is doing alright, more flights and practice might help. Perhaps, it's time to consider putting a higher tiered, better armed Bell P-63 Kingcobra into the game? A strategy I have been experimenting with is assisting with capturing the nearest points, defending those areas as much as possible and when the Squall Line is activated (when respawning is turned off), go on the offensive against enemy aircraft. So far, it appears to be working not too bad, if I can maintain some consistency. A few more battles will show me if I am on the right track with this, or not. 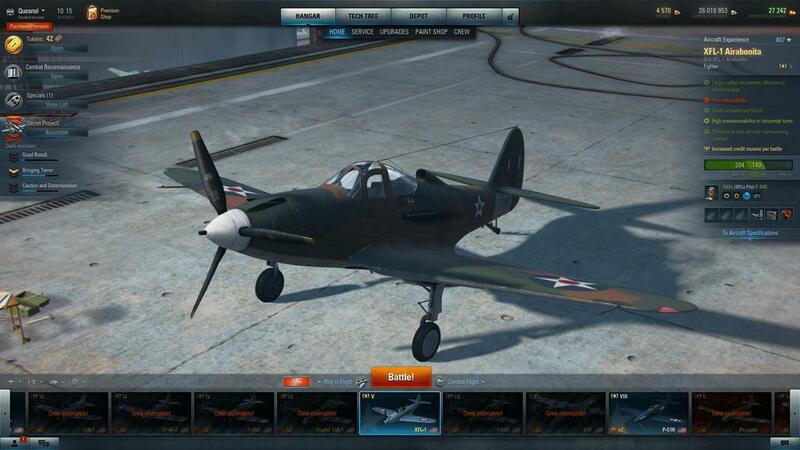 If there is one aircraft that 2.0 has made huge impact one, it's the tier V premium Curtiss P-40 M-105. 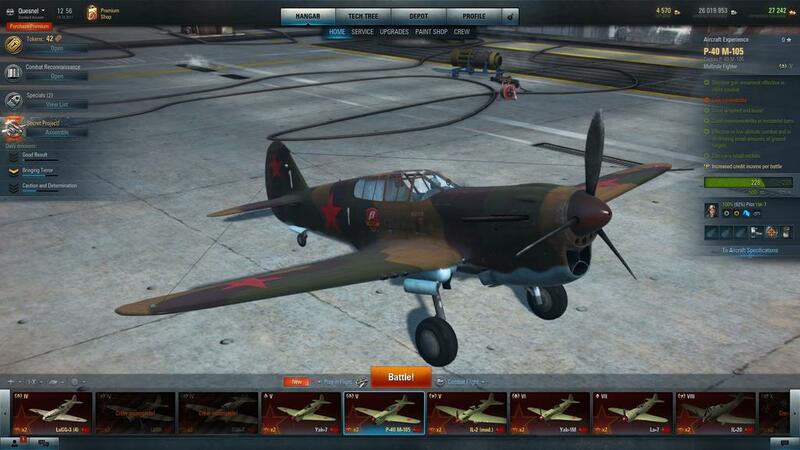 This Lend-Lease, Soviet powered, American plane was mediocre at best in the pre-2.0 days. Poor climb rate, due to a highly asthmatic engine and machines guns that felt considerably weaker than it's American counterparts, it wasn't a whole lot of fun to fly. Sure, I might have had a few great matches in mine, but those were rare and very reliant on the circumstances playing into my favor. I played it from a defender/interceptor role and didn't bother with the optional wing mounted rockets. I was amazed I was able to climb up to where the enemy bombers were flying and took a few down for good measure. The machine dealt out slow, but fairly reliable damage and diving down on adversarial attack aircraft paid back the dividends. Granted, one battle doesn't set the standard for future expectations, but this sortie does show promise from the changes that came with the latest update, especially for this aircraft. If you have a Fw190D, Tier VII, I want you to try an experiment with it and post the results here. At battle start, roof it until it stalls, then hands off the controls and just watch what happens.